G-type star. She heard the words with a tremendous lightening of her heart. That was the best possible candidate for a world they could live on. No one else spotted any that they were sure of, and by the time they were done, the second jump had begun. After another tense-yet-boring wait, Sakura repeated the maneuver and started the comparison running again. This time, Hitomi spotted two more that she thought moved. A close comparison showed that she was right, but the movement was small compared to the now very noticeable movement of the first star. One appeared to be a red dwarf about three light years out, and the other a brighter star five light years away. “That’s just fine, honey. Hold off on the jump for a little bit. Everyone, unstrap for a moment so we can all talk together,” said her mother. The others unsnapped quickly. It took Whips a little longer to release all his hold-downs. “First… all of you, come here,” Laura said. She reached out and hugged little Hitomi to her, and gestured the others close. The patterns that rippled chaotically over Whips’ skin showed that he, too, was close to the equivalent of tears. He drifted over to the others and wrapped all three arms around the Kimei family; Sakura and the others gripped his arms and hands, and even though he was so very different… it was still exactly like a hug from their own family. For a few moments they all hung there, not moving, just accepting that for now, they were together, and a family, and safe. Hitomi nodded, brightening. Melody, eyes still huge and frightened, also nodded. She’s smart enough to know we’re not anywhere near safe yet. “Right!” said Sakura; her attempt to sound confident and ready didn’t fool Whips, she was pretty sure, and probably not her parents. “Of course, Mom,” Caroline agreed. “Can we tell if this is the right star?” Akira asked. “My omni does,” Melody said. “I was playing with chemical analysis packages,” Melody answered defensively. “Umm… Hold on a minute.” Where are the specs on all these things? Oh, there’s the info tags… Okay! “The Sun’s a G2, right?” Whips asked. “That’s right,” Sakura answered, glad she knew some of this. “A G3 will be just a little tiny bit cooler and smaller than the Sun, I think, but we won’t notice the difference.” If there’s a planet to land on, anyway. “I didn’t expect you would,” Whips said calmly. Sakura bit her lip. The European Bemmies weren’t obligate carnivores, but they did need a lot more protein — of the generally animal sort — than anything else. The more “balanced” human rations wouldn’t be terribly good for Whips, and he’d have to eat a lot more of them, even in proportion to his size. How long would their supplies hold out? “We’ll have to make do,” her mother said. “I know they’re not ideal for you, Harratrer, but we have I think three months’ supplies. Even with you onboard, we should be able to keep going for two months, and that should be more than enough now.” Unspoken was the fact that immersion issues might become acute long before then. “Thank you, Dr. Kimei.” Sakura could tell that Whips’ formal-sounding voice hid much more relief and gratitude. They’d found a good star. The drive was working. Maybe they’d get out of this after all. I doubt it’s a reference to Alien Legacy, but I have to ask if it is. Actually, it’s a dual reference. One to the original myth and word descended of it, as it is the goal they HAD and will never actually reach, the other to Tantalus from Star Trek (although really there’s no parallel, since this was a regular colony, not a penal one). Any idea when the A-ERC will be available? I have such a problem with delayed gratification! Hey, it’s been long enough since the end of the last series that Bemmies could have started immigrating to Europe, right? OK, so in this chapter they do seem to have a guess as to approximately where they are, and they do seem to be aware of whether they expected there to be any stars along the route. And they drop some clues that possibly the main ship was off-route. I suppose if I had read this a few minutes after the last chapter, instead of two days later, I wouldn’t have been as bothered about some of issues I raised there. Basically they know they’d traveled about halfway to their destination, which was about 100 LY off, so they had come 50 or so light-years. With a decent map of the local area they know what stars ought to be around, but since they don’t know EXACTLY where they were dropped off they don’t have the crucial knowledge of how close they might be to any actually habitable planets. With the AI/onboard computers dead or nearly so and no one on board a qualified navigator, they’re missing the tools that might make this easy. And honestly, the lifeboat drills were mostly for IN-SYSTEM disasters — whenever they stopped in a solar system. There’s nothing to hit in Trapdoor space, and they carry engineers and such to repair failures in essential systems, so the likelihood of a disaster in interstellar space was seen as very low. The report from _Outward Initiative_, assuming it gets safely to a nearby colony, will change that perception, of course. No kidding…I’m trying to picture the media response to the Initiative’s return, and…just…no. Ouch. 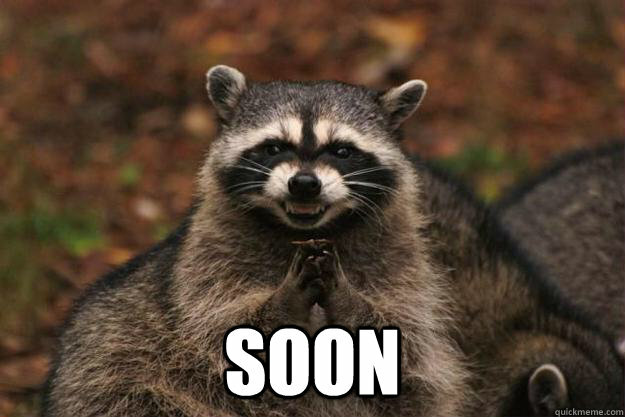 PS: Someone kill that damned “soon” raccoon! Gaaaah! Death to the raccoon!!! Lol. Let me know, then, as $15 is a bit much in my budget at the moment and I’d want it (I lack all patience). It’ll be announced here when it comes out, as well as on my site!